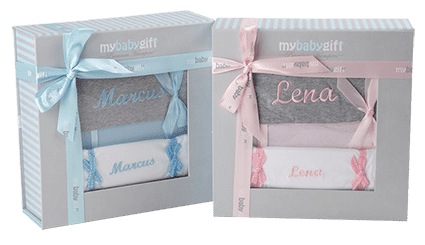 MyBabyGift gift sets are beautifully presented on delivery in our signature grey and blue striped gift boxes, tied in either baby-blue or baby-pink satin quality ribbon. The items inside the box are presented in a stunning, elegant way. They are carefully wrapped in matching quality ribbons presenting the baby’s name when opening the box – leaving a “wow” impression.